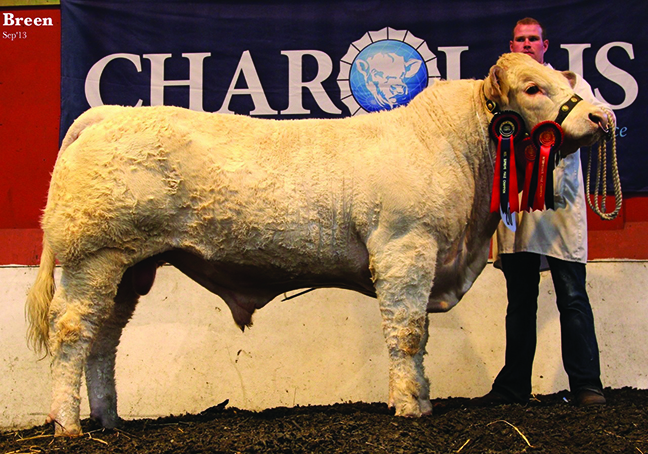 The National Charolais Show attracted 100 entries to its Fintona venue on Saturday 13 September where after a four hour judging stint, Scottish livestock enthusiast, Michael Durno, Glenlivet found his respective male and female champions in Coolnaslee Ivanhoe and Bessiebell Incredible. 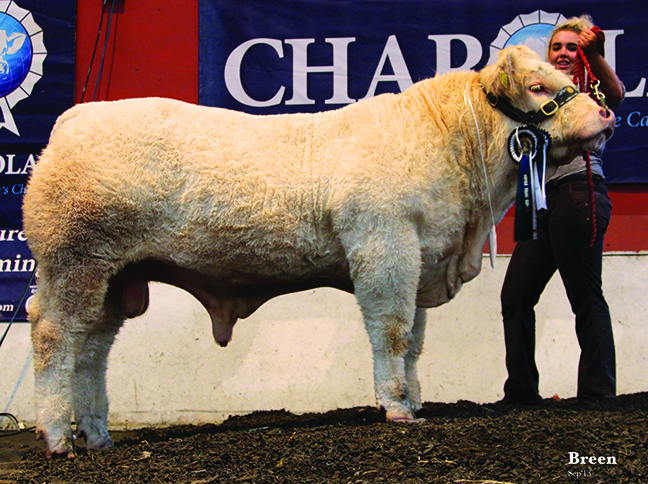 Ivanhoe, an 18 month old by the 12,000gns Maerdy Fiend was bred and exhibited by Gilbert Crawford, Maghera, County Down. He was no stranger to the ring having been placed first in his class and a member of the winning group of three at the Balmoral. Bessiebell Incredible added another championship to her success this season by being awarded the female title. 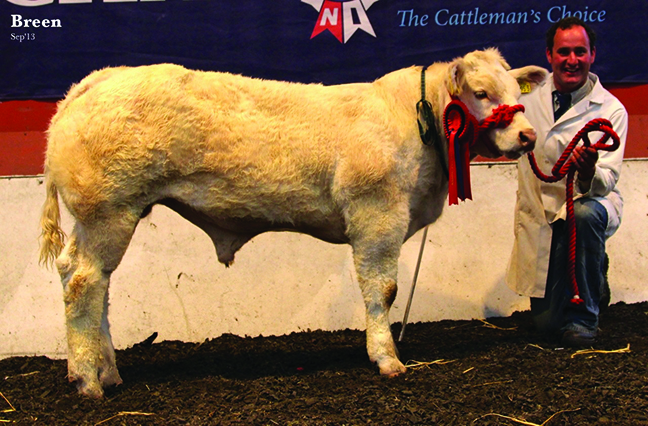 Bred and exhibited by Jack Smyth, Newtown Stewart, County Tyrone, this 16 month old was by the 25,000gns Goldies Unbeatable and out of an Aghyoule bred dam. 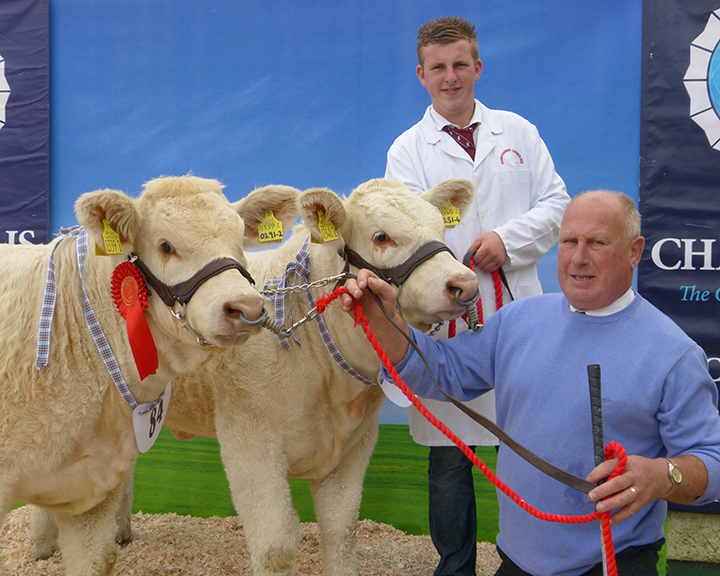 A line up of eight entries in the pairs section was led by a couple of upcoming heifers from Harold Stubbs and his grandson, Alan Burleigh, Liznaskea, Fermanagh. Derryharney Jazzypants was a seven month old Blelack Digger daughter whilst team mate, Derryharney Jaffa was a five month old by Derryharney Outstanding. Standing below them in reserve place was Killadeas Inverness and Killadeas Ireland from father and son team, Stuart and David Bothwell, Ballina Mallard, Fermanagh. Sup, Alan Veitch, Shadow; res sup, Michael Gallagher, Faye. Sup: Philip Johnston, res sup: David Rea. Junior: 1, Oisin Quigley; 2, James Morrison; 3, Clarke Balfour. Intermediate: 1, David Rea; 2, Tara O’Brien; 3, Sarah Johnson. Senior: 1, Philip Johnston; 2, Gerard McShane. 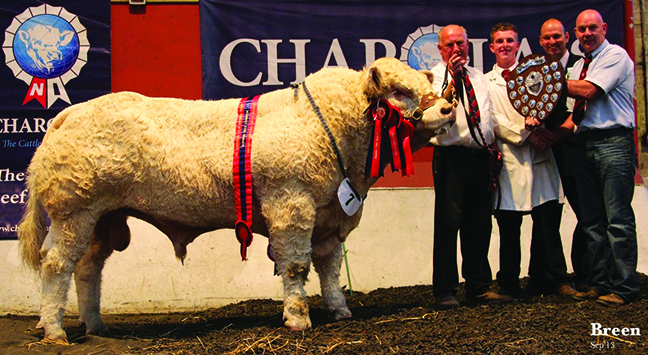 Large crowds gathered around the ring for one of the most successful National Charolais shows in years; the charolais club worked hard to bring together the 15th annual show in the Ecclesville Equestrian Centre in the secluded village of Fintona in County Tyrone. 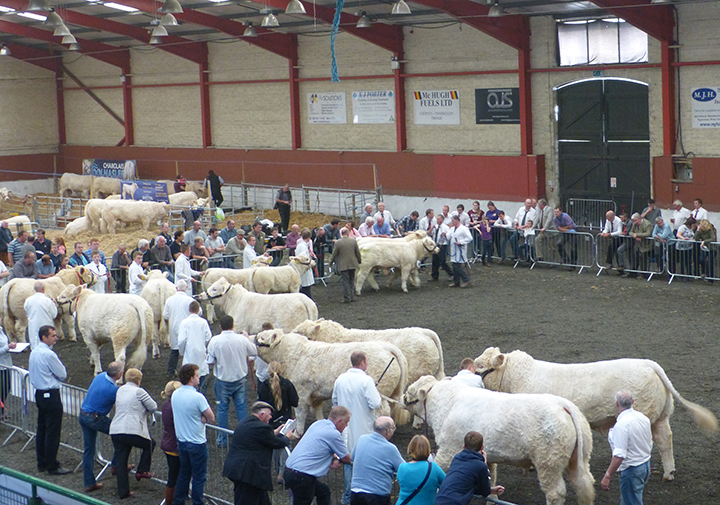 Who would ever dream of such a show specular of 100 Charolais cattle been shown in the large arena on a quiet Saturday afternoon. Judges Sharon Rothwell Wicklow and Ian Bell Cumbria were extremely impressed with the lineup of cattle presented to them for judging. 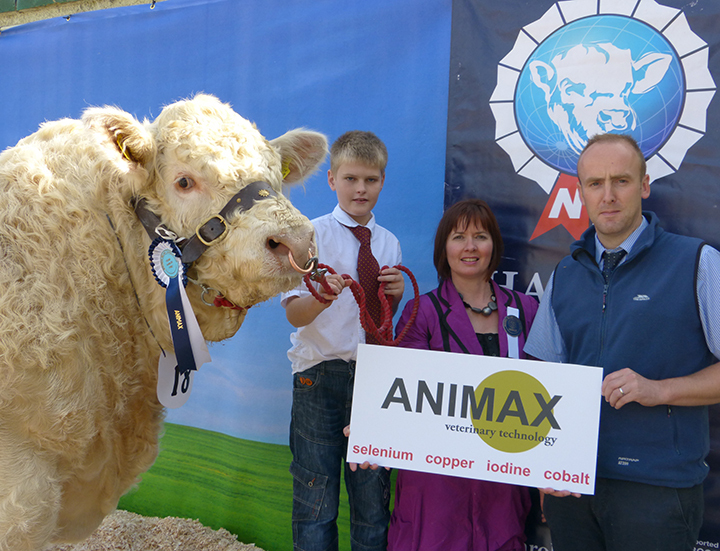 Sharon Rothwell had the task of judging the Animax Young Handler Competition. It took a new format this year with preparation of the animal and knowledge of the breed being part of the criteria as well as handling skills in the showring, split into three sections it allowed many of our young people the opportunity to try their hand at handling. Showing is a serious business and from early morning exhibitors were preparing their animals to ensure that they looked their very best. The competition was stiff as it is the last big opportunity to showcase their stock before winter. 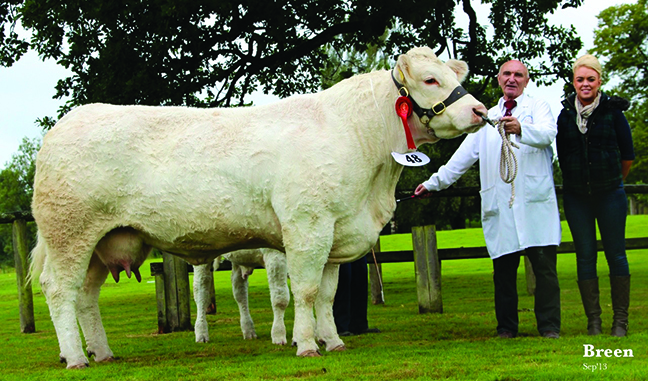 The event allows breeders to present their pedigree and commercial Charolais cattle to the wider agricultural community and the agri food industry. The judging began with Sharon Rothwell in the show ring for the Senior Intermediate & Junior Animax Young Handler Competition; it was a tough competition amongst the most experienced handlers with Alan Burleigh & Philip Johnston through to the championship, in Intermediate we had seven entrants and again the young people were doing extremely well in the showring, Eimear McGovern & Mark Breen went through to the championship, these four put on a good show and Alan Burleigh was declared the champion with Eimear McGovern in Reserve place. The junior competition followed and it was lovely to see our 8yrs to 12 yrs leading their cattle proudly around the ring whilst focusing on the judge, the winner in this section was Jack Ritchie with brother Sam Ritchie taking reserve place. Neil Acheson Animax was on hand to present the Animax cup to a very pleased Alan Burleigh. 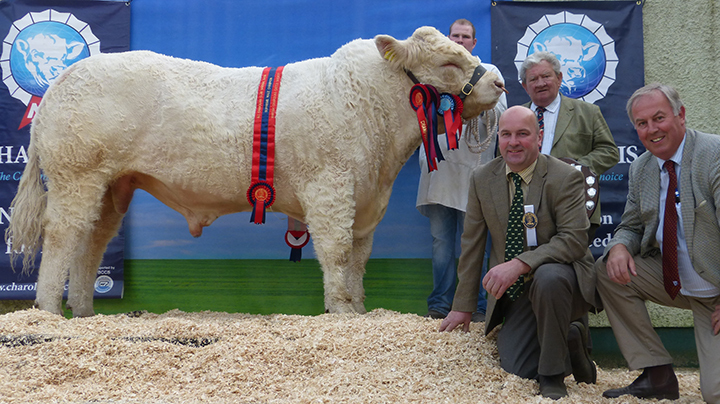 Mr Ian Bell is from the well-known Hallbankgate Farm in Cumbria needs no introduction in the world of pedigree charolais; he entered the ring to judge thirteen pedigree classes with very good entries and spectators commented on the quality of the animals on show. After the pedigree championships everyone agreed the judging was completed expeditiously. This was followed by the Commercial section with four classes for commercial stock judged by Sharon Rothwell; the Commercial Championships were sponsored this year by Linden Foods Ltd who were not disappointed with the result; S & K Williamson’s herd took the championship with a superb animal Goldilux being presented with the McAllister Trophy, and James Alexander Jalex herd took reserve place with Ted; both animals were a prime example of the very best commercials in the province. 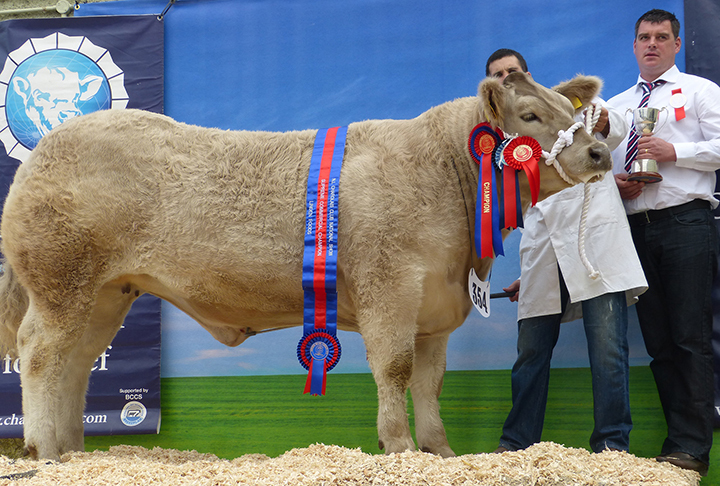 The highlight was the British Charolais Cattle Society championships; Junior Intermediate and Senior Female Championships were hotly contested with spectators waiting to see which animals would take the Supreme Female in show. 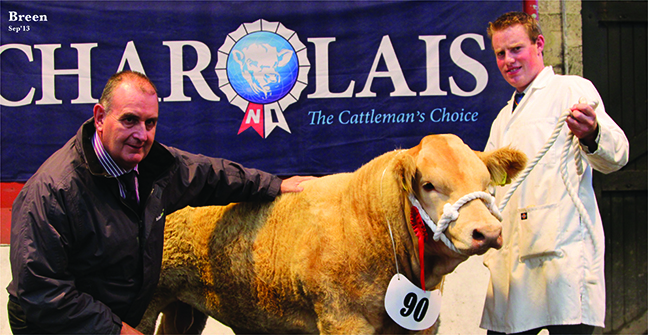 The overall Female title went to an exceptional heifer Coolnaslee Gracious an animal that has been showing herself well this past year; sired by Sportsman Columbo and out of a homebred dam Coolnaslee Delux. Owned by G J Crawford and winning the coveted Desmond Anderson Cup. 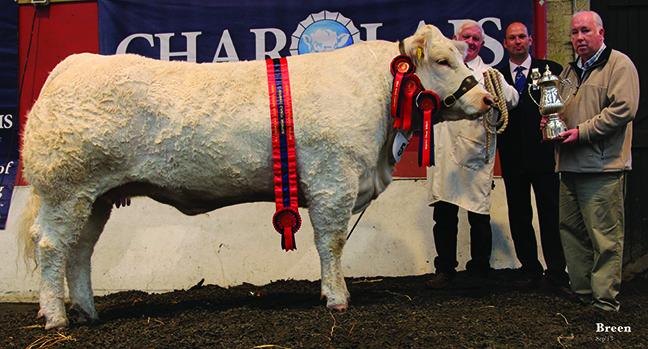 The reserve champion went to Coolnaslee Gillian sired by Sportsman Columbo and also owned by GJ Crawford Maghera. This was followed by the Junior Intermediate and Senior Male Championships, drawing out the best of the classes to compete for the coveted title of overall Supreme Male Champion which went to Derryharney Happy Harry sired by the well-known Shanleive Titus with a homebred dam Derryharney Evarose owned by HC Stubbs & AA Burleigh who were presented with the Robert Scott Shield by Sean McGovern council representative and judge Ian Bell. 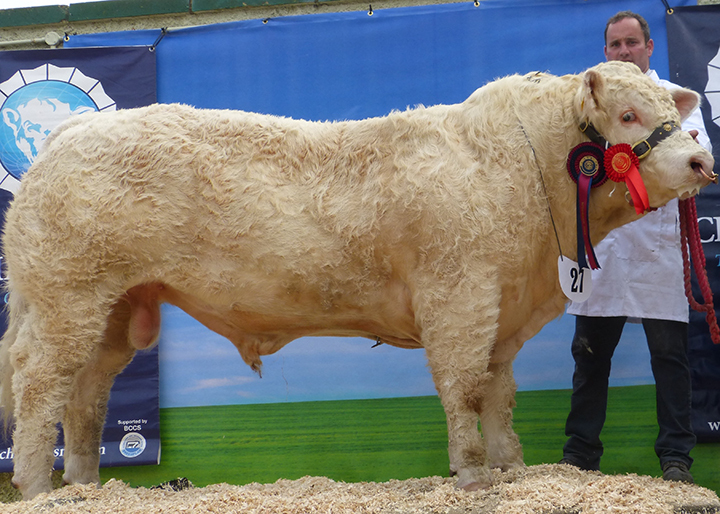 The Reserve Male champion in show was taken by Coolnaslee Hussar sired by Goldies Carnival dam Loganbar Bounty and owned by GJ Crawford Maghera. The commentator for the event was Mr Edwin Morrison who had a busy stint on the microphone, with assistance from stewards and officials. Edwin also introduced and thanked the many sponsors who attended the show to present the winning rosettes and trophies. He thanked to all who had worked so hard to make the show such a success especially all the exhibitors for presenting their animals so professionally. In the pedigree section we are indebted to; Natural Nutrition, A N Irwin & Sons, Teemore Engineering, Dungannon Farmers Mart, Donnelly Quarries, Parkview Veterinary Clinic, Dovea Genetics, ob construction, Western Farm Enterprises, Gortin & Lisahally Livestock Marts, Genus ABS, Woolsey, AJS Promotions, British Charolais Cattle Society. In the commercial section we are indebted to S & M Engineering, Bothwell Farm Supplies McGirr Haulage & McClelland’s Livestock Mart for financial support in the four main commercial classes and Linden Foods Ltd for sponsoring the Commercial Championships. The show catalogue was sponsored by Bank of Ireland. The charolais club wishes to thank the management of the Ecclesville Centre for their assistance and also Omagh District Council for their support. 1st MR H C STUBBS & MR A A BURLEIGH – DERRYHARNEY HAPPYHARRY. MBM0054609. (UK948371303074). b. 08/04/2012. s.SHANLEIVE TITUS. d.DERRYHARNEY EVAROSE. 2nd L A RICHARDSON & SONS – HILLVIEWFARM HANDSOME. MBM0053970. (UK948383013546). b.11/04/2012. s.MOWBRAYPARK ORLANDO. d.HILLVIEWFARM DAWN. 1st S & D BOTHWELL – KILLADEAS HULK. MBM0054476. (UK945253959205). b. 05/05/2012. s.BLACKFORD DYNAMITE. d.KILLADEAS ELEGANT. 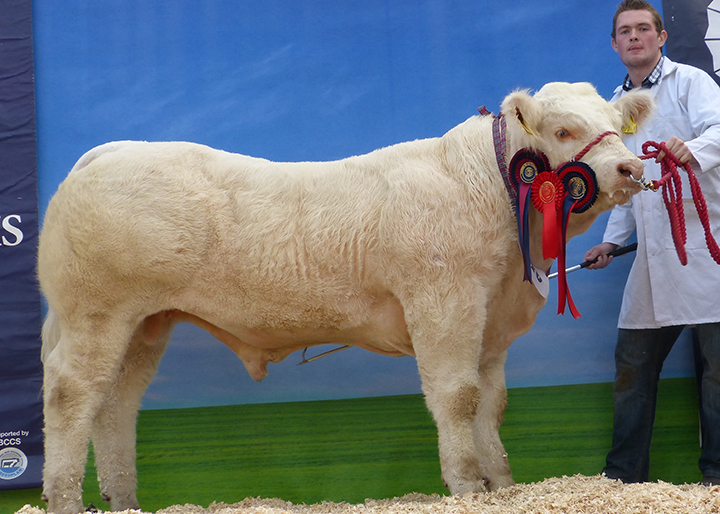 2nd S&A BELLEW – KILTYBANE HARVEY. MBM0057204. (UK924222615876). b. 21/06/2012. s.DEELEVIEW EVAN. d.KILTYBANE COLLEEN. 3rd MR S HEENAN – PARKVIEW HUSTLER. MBM0054735. (UK937317607204). b. 20/05/2012. s.SPORTSMANS COLUMBO. d.PARKVIEW CHERRY. 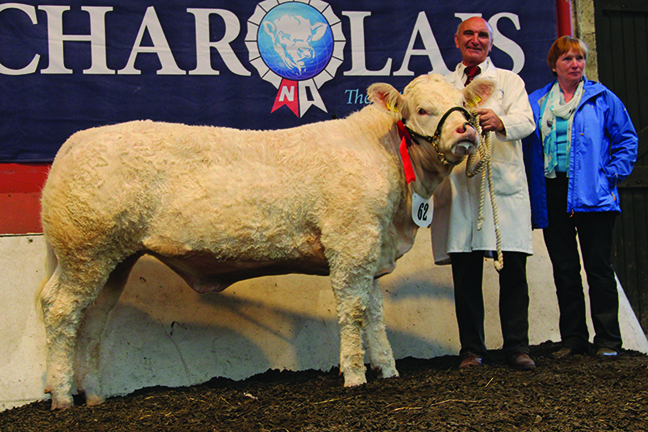 1st MR G J CRAWFORD – COOLNASLEE HUSSAR. MBM0056526. (UK95635815281). b. 04/07/2012. s.GOLDIES CARNIVAL. d.LOGANBAR BOUNTY. 2nd MRS V MCDONALD – GLENCOE HULK. MBM0055419. (UK924401002185). b. 23/07/2012. s.CLYTH DIPLOMAT. d.GLENCOE VICKY. 3rd MR H C STUBBS & MR A A BURLEIGH – DERRYHARNEY HARRISON. MBM0055643. (UK948371303133). b. 02/08/2012. s.THRUNTON BONJOVI. d.DERRYHARNEY VIOLA. 1st L A RICHARDSON & SONS – HILLVIEWFARM HALO. MBM0055840. (UK948383013621). b. 03/09/2013. s.ALLANFAULD VAGABOND. d.ELGIN ELISHA. 2nd MR S MCKENNA – LISCORRAN HARDY. MBM0056195. (UK958214700381). b. 10/10/2012. s.BURRADON TALISMAN. d.KILLADEAS BELLE. 3rd MR S MCGOVERN – RATOARY HONKYDORY ET. MBM0057115. (UK958185508152). b.23/11/2012. s. OLDSTONE EGBERT. d.DEERFIN TINA. 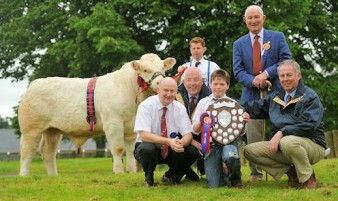 1st S & D BOTHWELL – KILLADEAS IVAN. MBM0058178. (UK945253959953). b. 05/04/2013. s.BLACKFORD DYNAMITE. d.KILLADEAS VASE. 2nd MR R MCWILLIAMS –STRANAGONE ILIKEYOU. MBM0059325. (UK956085025653). b. 05/05/2013. s.DERESKIT FERNANDO. d.FALLENHINCH FANNA. 3rd DEVINE BROTHERS – BROWNHILL ISAAC. MBM0058079. (UK965185807527). b. 21/04/2013. s.SHAEN TOPPER. d.MOORLOUGH CLEO. 1st MR G J CRAWFORD – COOLNASLEE DIANE. MBF0038174. (UK95635813656). b. 13/01/2008. s.ALLANFAULD SUPERSCOT. d.COOLNASLEE PEARL. 1st MR G J CRAWFORD – COOLNASLEE GRACIOUS. MBF0054074. (UK95635814732). b. 26/02/2011. s.SPORTSMANS COLUMBO. d.COOLNASLEE DELUX. 2nd MR G J CRAWFORD – COOLNASLEE GILLIAN. MBF00540769 (UK95635814802). b. 27/04/2011. s.SPORTSMANS COLUMBO. d.COOLNASLEE CARMEN. 1st MR G J CRAWFORD – COOLNASLEE GLAMEROUS. MBF0054072. (UK95635815034). b.08/08/2011. s.SPORTSMANS COLUMBO. d.COOLNASLEE CARMEL. 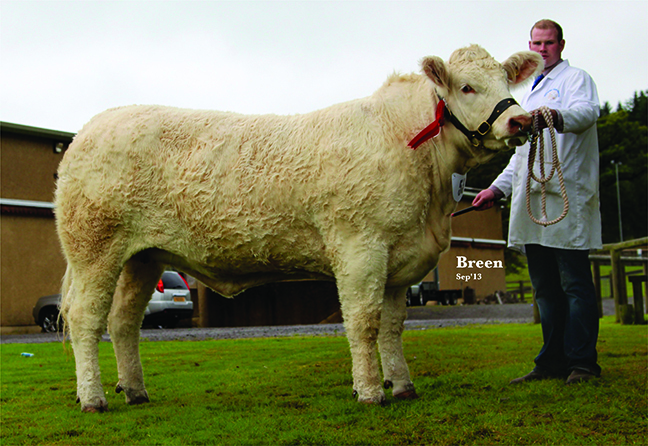 2nd L & M BREEN – KILBRIDEFARM GAIL. MBF0054426. (UK906234428401). b. 06/08/2011. Bred by W H ROBSON & SONS. s.DOONALLY VIEW. d.KILBRIDEFARM ELLEN. 1st MR G J CRAWFORD – COOLNASLEE HELGA. MBF0059432. (UK95635815211). b.01/03/2012. s.SPORTSMANS COLUMBO. d.COOLNASLEE DAYDREAM. 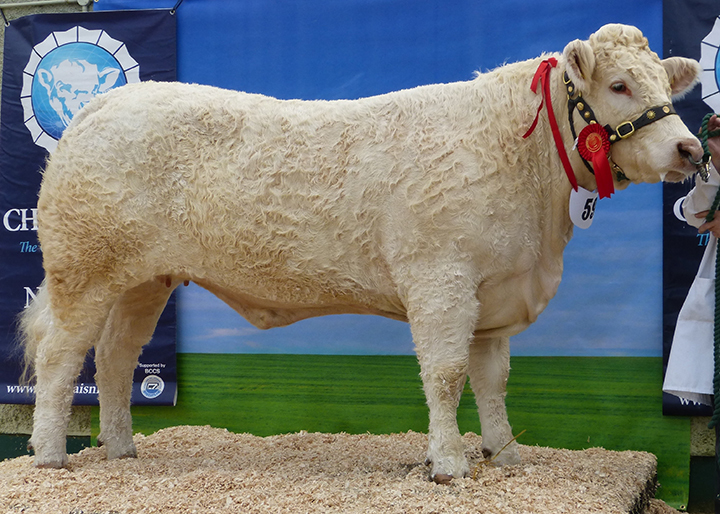 2nd S & D BOTHWELL – KILLADEAS HAZEL. MBF0056537. (UK95635815211). b. 18/03/2012. s.BLACKFORD DYNAMITE. d.KILLADEAS ERIE. 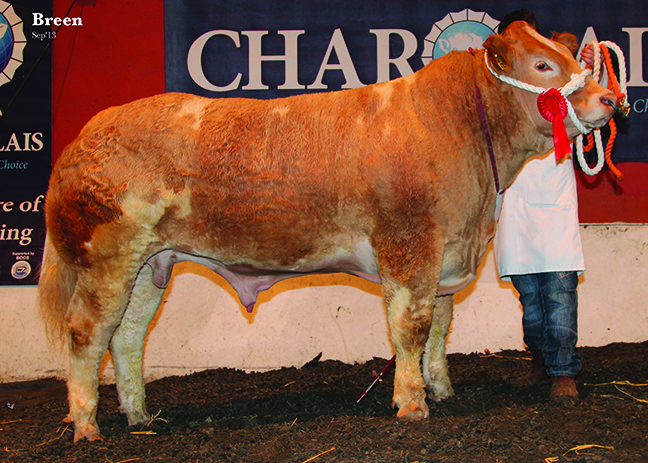 3rd MR R T V HEWITT – SILVERBRIDGE HOLLY. MBF0055773. (UK963162403546). b.20/01/2012. Bred by MR W J J BROWN. s.THRUNTON BONJOVI. d.SILVERBRIDGE EMILY ET. 1st MR C WALSH – GLENCOE HARMONY. MBF0060408. (UK924401002222). b. 30/08/2012. Bred by MRS V MCDONALD. s.DARTONHALL BRANDY. d.BROWNSPRIDE VALENTINO. 2nd MR M CONNOLLY – PALACE HELENA. MBF0058636. (UK958132419012). b. 20/08/2012. s.DOON ULTIMATE. d.PALACE DEIRDRE. 1st MR G J CRAWFORD – COOLONASLEE HONEY. MBF0059438. (UK95635815336).b. 02/09/2012. s.GOLDIES CARNIVAL. d.COOLNASLEE VALE. 2nd MR R H SINNAMON – AUGHAFAD HANNAH ET. MBF0059655. (UK959020413666).b. 26/10/2012. s.THRUNTON VOLDEMORT. d.BLAKESTOWN DELROMEY. 3rd MR G J CRAWFORD – BLELACK HARMONY. MBF0059033. (UK521115303054). b. 03/10/2012. Bred by MR N F MASSIE, OBE. s.BALMYLE DINGLE. d.BLELACK BABE. 1st MR S MCKENNA – LISCORRAN IGNITE. MBF0061366. (UK958214700403). b. 04/04.2013. s.NEWHOUSE BIGAL. d.THRUNTON DANCER. 2nd MR H C STUBBS & MR A A BURLEIGH – DERRYHARNEY ISOBEL. MBF0059741. (UK948371303181). b. 08/01/2013. s.HILLVIEWFARM PERFECT. d.DERRYHARNEY GLORIA. 3rd DEVINE BROTHERS – BROWNHILL INDIGO. MBF0059749. (UK965185807516). b. 20/1/2013. s.GOLDIES UNBEATABLE ET. d.BROWNHILL FOXY. The NI National Charolais Show attracted a record turnout of 100 pedigree entries plus 27 commercial and 16 young handler entries at Fintona on Saturday 16 June. Heading the male section was a 12 month old by the 55,000gns Sportsmans Columbo. Sandelford Gilberto was out of a home-bred dam going back to Oldstone Egbert and was owned and bred by G Henderson, Bushmills, County Antrim. 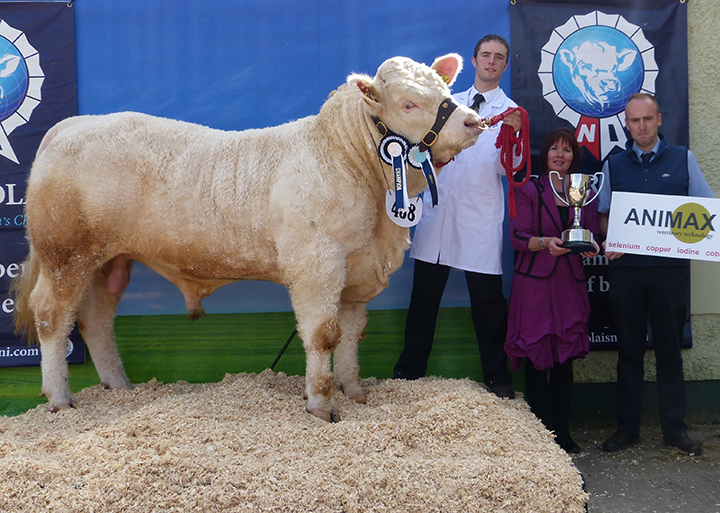 Reserve male champion went to Glencoe Galliant owned and bred by V McDonald, Newry, County Down. This 12 month old by Clyth Diplomat and out of a home-bred dam had already been awarded honours this year with the junior male championship at Balmoral. 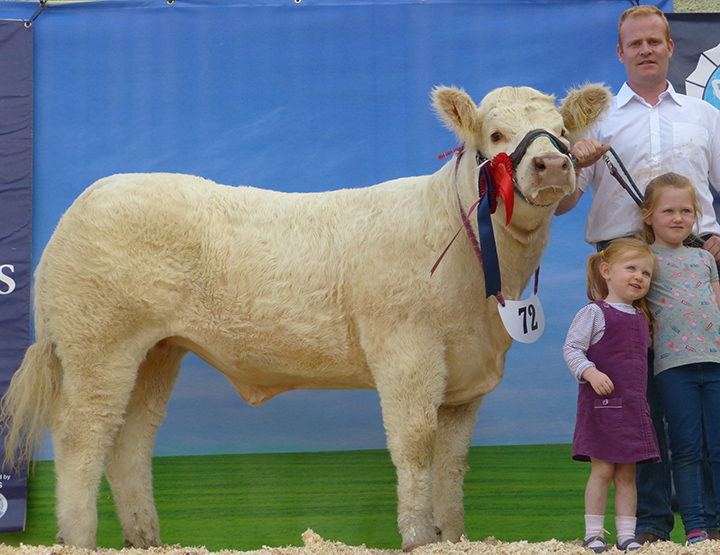 Female champion went to Cornascriebe Flo, a two year old that had already secured reserve champion of champions at Balmoral earlier in the summer. By the 55,000gns Thrunton Voldemort and out of a home-bred dam, this one was owned and bred by Messrs J A Watson and Son, Portadown, County Armagh. Reserve female champion was awarded to Coolnaslee Fergie, a 23 month old bred and owned by G J Crawford, Maghera, County Londonderry. 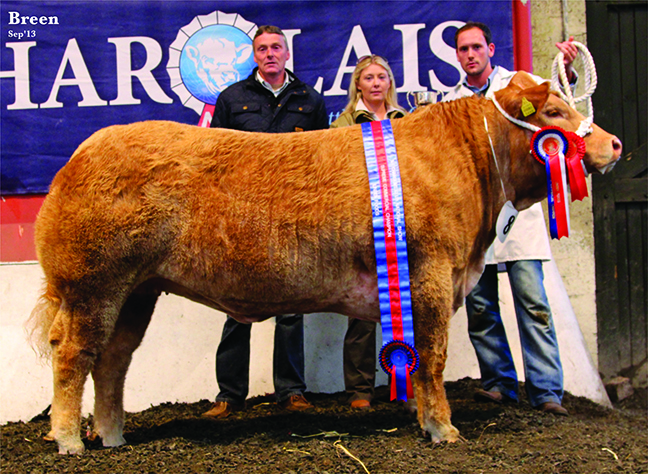 Fergie, by the 55,000gns Sportsmans Columbo and out of a home-bred dam, had previously secured champion heifer at Balmoral. 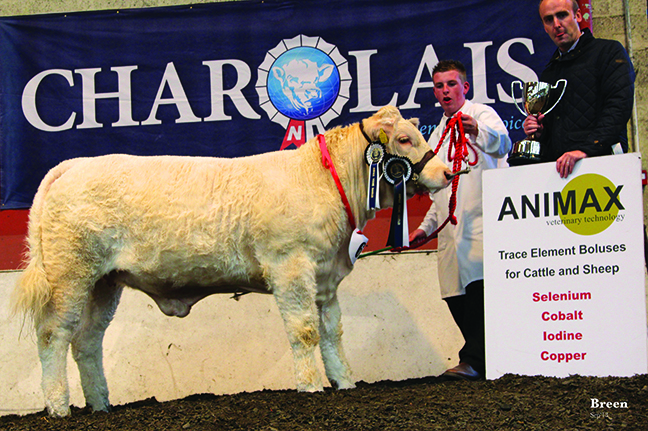 In the commercial section, overall commercial champion went to Olympic Gold, a bullock from J Alexander, Randalstown, County Antrim. 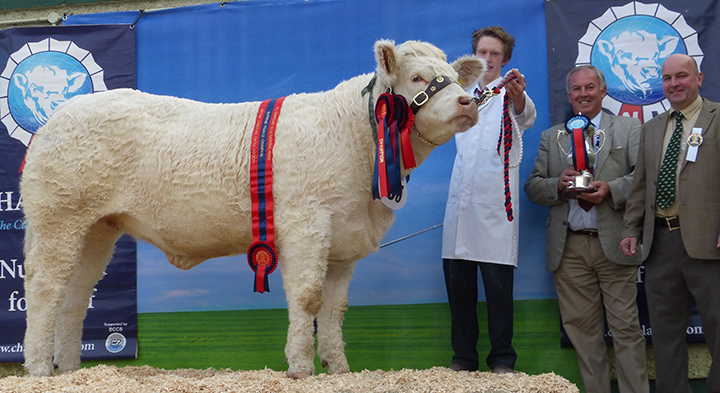 Reserve commercial champion was awarded to heifer Vanilla Ice from S McIvor.